The "Austria" which was built for Herr Kronfeld in the Segelflugzeugwerke at Kassel. The small wheels have recently been added to facilitate towing-off by an aircraft. The Austria. A new 103-ft. span cantilever glider which has been built for Herr Kronfeld. The wings are completely plywood covered, and the rudders can fold inwards together for use as air brakes. The Austria amid the hay at Hanworth. 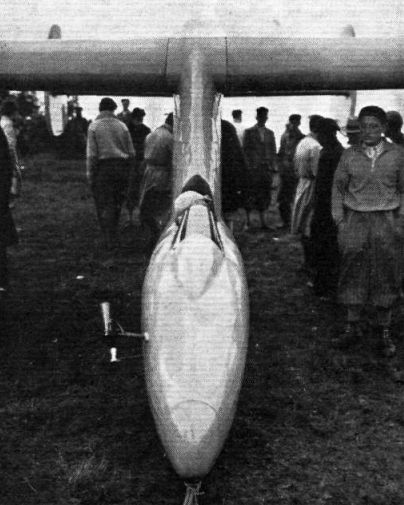 LOW HEAD RESISTANCE - STYLE TWO: Herr Robert Kronfeld believes in a blunter nosed fuselage than the "Meiningen" as can be seen from this unusual view of his "Austria" taken shortly before his accident at the Wasserkuppe. The unorthodox tail unit of Austria. The new glider which has been built for Herr Kronfeld to create a few more records on.